DetailXPerts of Southwest Indianapolis is a local car wash that uses a unique cleaning method and provides prompt, efficient and superb customer service. Southwest Indianapolis, November 7th , 2016 – DetailXPerts of Southwest Indianapolis is a local car wash that uses a unique cleaning methodology and provides prompt, efficient detailing and superb customer service by honest technicians. This local car wash is a franchisee of DetailXPerts which offers a unique steam methodology for cleaning all types of vehicles. 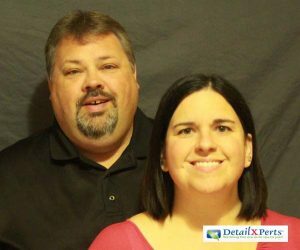 What makes DetailXPerts of Southwest Indianapolis stand out? Aside from a unique, effective product, this local car wash is owned and managed by husband and wife Bryan and Gail McKinney. Bryan works as a loss prevention manager for a Fortune 500 company. He uses this experience and expertise in training prompt, honest and efficient detailers, thus ensuring safe and top quality detailing all the time. Gail, on the other hand, was a former prototype facilitator for an automotive parts company. She has a solid background in the automotive industry and customer service. “I managed people for a long time and can talk to anyone. I don’t believe I am better than anyone and am willing to learn from those who know about the industry and who have worked it,” Gail said. With this able husband-and-wife tandem at the helm of this local car wash, any vehicle owner can be assured of superior detailing all the time. As they searched for the right business opportunity that would allow them to take ownership of their future and be involved in their daughter’s life, they came across DetailXPerts along with two other franchises. They weighed the pros and cons of each. Considering the area they are in, they immediately saw how DetailXPerts can help them achieve their dream. “My husband and I chose it together. We felt with the area we were in, it would be the best fit for us. Private vehicle owners in the area are plagued with the issue of road salt during winter while truck and fleet owners find it difficult to retain drivers because their equipment is not kept up and the semi cabs are not maintained. Who wants to drive a semi with roaches and what not?” Gail said. To anyone who wishes to be a DetailXPerts franchisee, she suggests that they should be prepared to go out after the business and learn to enjoy cold calling. As for the training and support from DetailXPerts, Gail says the training was good and the support is definitely there. DetailXPerts of Southwest Indianapolis has several services to offer: hand car wash, interior car detailing, fleet wash, truck wash, mobile truck washing, semi truck cleaning, truck washouts and other car and truck washing services in Camby, Avon, Plainfield and Indianapolis. Other lines of service include automobiles, boats, motorcycles, RVs, buses, and more. Businesses are welcome to inquire for special rates and long-term relations. You can easily reach them at 502-631-9770 and schedule your free demo!